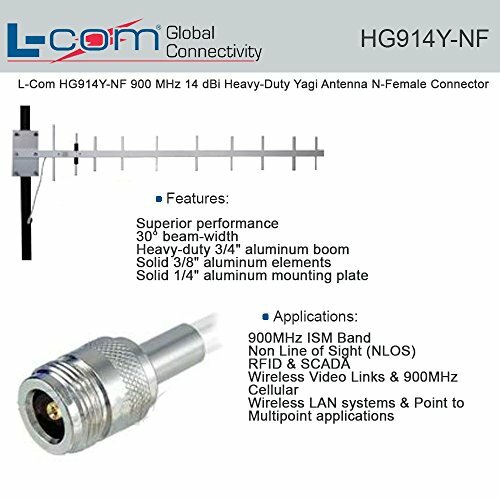 HyperGain HG914Y High-Performance Yagi Antenna combines high gain with a wide 30 beam-width. It is ideally suited for directional applications in the 900 GHz ISM and GSM bands as well as Non Line of Sight (NLOS) and Point to Multi-Point installations. Typical applications include 900 MHz Wireless LAN, SCADA, Wireless Video Links and 900 MHz Cellular. This antenna features a heavy-duty 3/4 aluminum boom and solid 3/8 aluminum elements. Secure mounting is assured by a solid 1/4 aluminum mounting plate and two stainless steel V-bolts.